For decades, Norway has cooperated with the European Union in matters of foreign policy, security and defence. It has thus participated in EU civilian and military operations, aligned itself with EU political declarations and restrictive measures against states and/or individuals, and collaborated with the European Defence Agency. 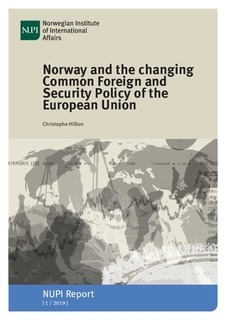 Unlike other frameworks of cooperation between the EU and Norway, such as the EEA and Schengen agreements, the cooperation in foreign policy, security and defence does not rely on a single setup, with elaborate institutional arrangements and dynamic obligations. Rather, Norway joins forces with the Union in an ad hoc fashion and often based on informal arrangements. This allows for flexibility, but also entails that Norway has few formal channels for exerting influence on EU CFSP decisions to which it subsequently subscribes. Against this backdrop, and as the EU has become more active in this policy area, Norway has shown a renewed interest in deepening its relationship with the Union in CFSP matters. This report examines the ways in which Norway can enhance its cooperation and develop its institutional arrangements with the EU in this fast-evolving field. The discussion is based on an assessment of what the EU is able to offer in view of its constitutional framework, as informed by its on-going discussions with the UK on a future security partnership post-Brexit. Given the increasing interactions between the CFSP and other fields of the EU’s activities, the analysis also discusses whether Norway may draw a cooperation dividend from its participation in the single market through the EEA, to build a deeper and more participatory cooperation with the EU in CFSP matters. The report envisages four possible ways of enhancing the Norway-EU cooperation in the area CFSP: an extension of the present cooperation by ad hoc participation in new CFSP initiatives, a more active use of other existing EU-Norway frameworks of cooperation including the EEA, the setting up of a distinct EU-Norway CFSP agreement and the participation in a multilateralised EU-UK CFSP partnership. The report is also discussed here.